Dakota Valley High School Head Coach Jeff VanDenHul presents his team the runner-up trophy following the Panthers' loss to Madison during the South Dakota High School Class 11A State Championship game at the DakotaDome in Vermillion, S.D., on Nov. 11, 2017. 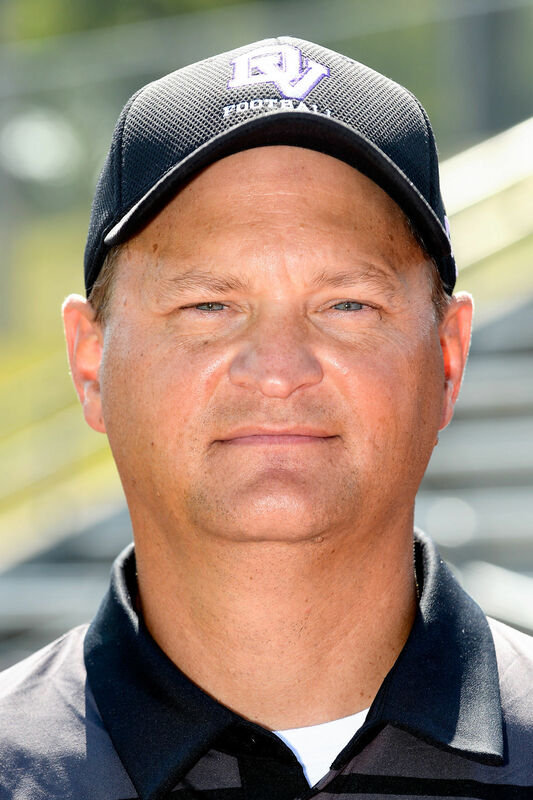 VanDenHul is the Journal's 2018 Football Coach of the Year. NORTH SIOUX CITY – Take it from someone who knows better than anyone, football is more than just a game for Jeff VanDenHul. Jeff VanDenHul has used that philosophy to guide the Dakota Valley High School football program to new heights. His 2018 squad was ranked No. 1 in South Dakota Class A for a good portion of the season and reached the state semifinals. The Panthers finished 9-2, losing only to 11A state champion Tea Area and runner-up Dell Rapids. Dakota Valley made it all the way to the state title game in 2017 before falling to a highly talented Madison squad. Today, the 49-year-old VanDenHul is honored as the Sioux City Journal Football Coach of the Year. VanDenHul has a long history at Dakota Valley, having served as head coach of the high school’s inaugural football team. He was coaching at Jefferson, South Dakota, when the school became part of the Dakota Valley system in 1994. He relinquished the head coaching duties after a season but stayed on as an assistant until 2010 when he became the junior high coach. Then, when the school was looking for a head coach again in 2013 to replace Jason Jund, who had done a tremendous job of rebuilding the program, VanDenHul took on the challenge. VanDenHul’s first squad in his second stint as coach finished 5-4, but successive 2-7 campaigns followed. A drastic turnaround followed, beginning with a 6-2 record in 2016 followed by a combined 20-3 mark the past two seasons. Josh VanDenHul, a 2008 Dakota Valley graduate, was teaching and coaching in Forest City, Iowa, when his father told him he would take the head coaching job at Dakota Valley if he moved back. “I actually quit my teaching job there before I came here because I wanted to come and coach with him,” said Josh VanDenHul, the team’s defensive coordinator. “A couple weeks later I got a teaching job at West and made it work. A noticeable advantage for Dakota Valley, Josh VanDenHul said, is that they work hard in the weight room. Austin Cole is another original member of Jeff VanDenHul’s coaching staff who coached offense until leaving for a position in eastern Iowa before last season. “The thing that stands out to me about Jeff is he is using football as a way to reach and influence kids on a much bigger level,” Cole said. “He is a great football coach but I don’t think it’s truly about football. He realizes if he teaches his kids how to block and tackle and execute plays on Friday nights that’s great but if he doesn’t reach out past their high school experience and doesn’t influence them beyond his football team he’s failed as a coach. A change in offensive strategy played a key role in the turnaround, according to Cole. Nate Rice moved from running back to quarterback this season and flourished in the single wing, rushing for 1,810 yards. Rice formed a dynamite combination with Sam Chesterman, who finished his senior season with 1,095 yards. “Any good program and head coach has to have good athletes,” Cole said. “If you ask Jeff he will recognize he’s had some real good athletes the last couple of years. Josh, 29, is Jeff VanDenHul’s oldest child and he also has a daughter, Ashley, 23, from a previous marriage. Jeff and his wife, Dorynda, are parents of daughters Gracyn, a 10th grader at Dakota Valley, and Jorja, an eighth-grader, along with son Grant, who is in seventh grade. Jeff is a career and technology education instructor in the Dakota Valley school district.